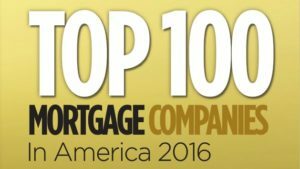 LINTHICUM, MD, May 1, 2017 — NFM Lending is proud to announce they ranked as one of the Top 100 Mortgage Companies in America for 2016 by Mortgage Executive Magazine. Each year, Mortgage Executive Magazine compiles a list of the nation’s top 100 mortgage companies and publicly traded banks by their total yearly mortgage volume. NFM Lending ranked in the 77th spot on the list, with a mortgage volume of $1,406,596,847 and 5,817 loans closed. NFM Lending was founded in 1998 by Silverman and his wife, Sandy. The company started as a small brokerage shop with 4 loan originators, and it is now licensed in 29 states, with more than 400 employees and over 40 retail branches. In addition to this most recent award, NFM Lending has been recognized many times for its exceptional company culture. In 2016 alone, it was named one of the Baltimore Sun’s Top Workplaces in the Baltimore area; one of the Washington Post’s Top Workplaces in the D.C. area; and one of Mortgage Executive Magazine’s Top 50 Best Companies to Work For. NFM Lending is proud of these accomplishments, and looks forward to another successful year.